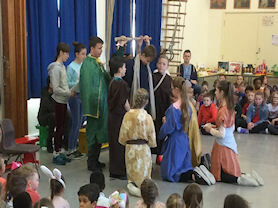 As in previous years, during the last week of the spring term the school holds mini assemblies with each class telling the events of Holy Week. 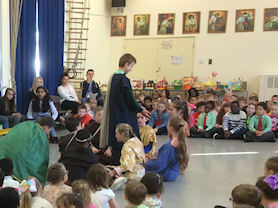 Year 4 presented the story of Palm Sunday and Jesus’ triumphant entry into Jerusalem. Year 3 acted out the Last Supper and Year 5 told us about Jesus’ agony in the garden. 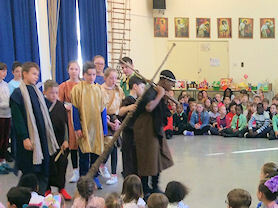 On Thursday 11th April, the final day of term, Year 6 reminded everyone about Jesus’ walk to Calvary and His crucifixion. The assembly then moved to anticipate the Resurrection. 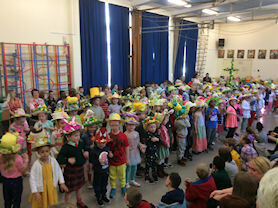 The younger children wore Easter bonnets and the older children decorated eggs. 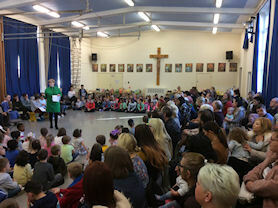 The hall was packed for our Easter assembly. Simon helps carry the cross. The risen Jesus appears to His disciples. 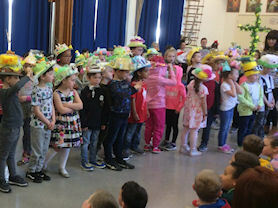 More fabulous Easter bonnets on parade.